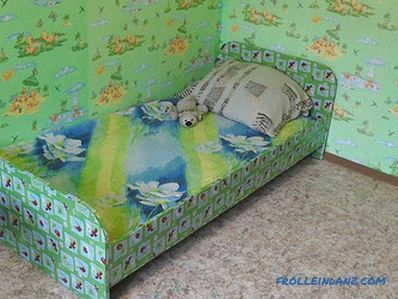 Now it is fashionable to independently make furniture at home, and every year the number of home craftsmen increases. 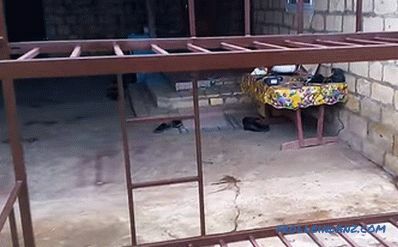 Someone prefers to buy blanks and from them to assemble the necessary furniture, and someone does all the work on its own from beginning to end. 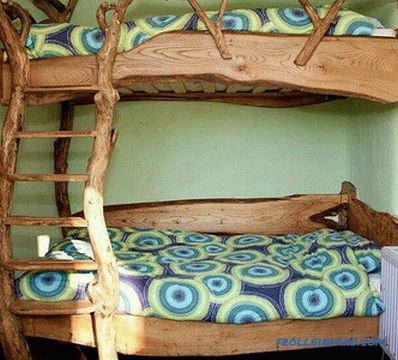 Homemade bed can be very simple or with intricate shapes and patterns. It is not only a matter of skill and availability of equipment - personal preferences and financial capabilities play an important role. 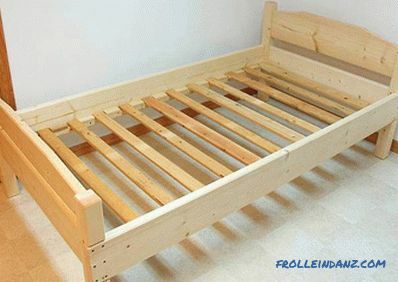 In this article we will explain how to make a bed with your own hands from various materials. Depending on which material is selected, certain tools will be needed to work with it. Jigsaw. 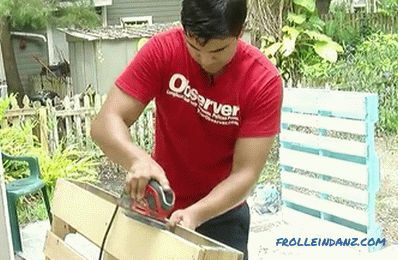 If the product is from the boards, you can do with a hacksaw. As for consumables, let's talk about it separately, considering this or that model. 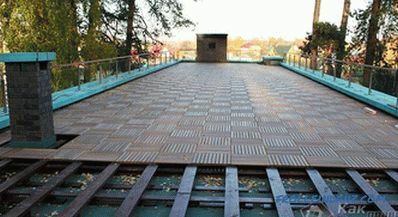 The above materials can be used both individually and collectively. 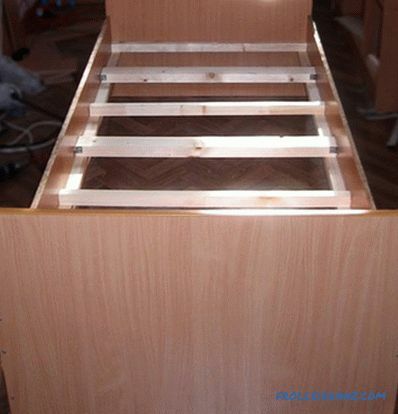 So, the metal bed can be equipped with wooden backs, and the product from plywood is assembled on a frame from a bar. 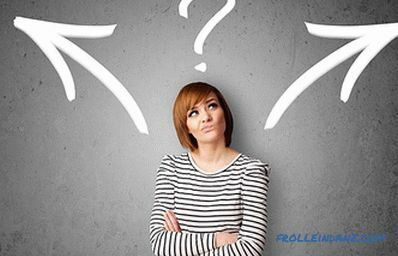 The options can be many, and in more detail you can figure it out by reading the article. The first step is to clearly define what the size of the future bed will be, given its location. 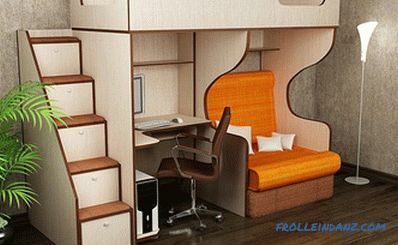 It is possible that you are modernizing the bedroom, changing its design, then you can move away from the usual patterns of bed placement and find a new place for it. If so, then pay attention to a number of tips that will help in this. Do not place a bed with a headboard to the window opening, as there will be a draft when the window is open and your head may be blown out. 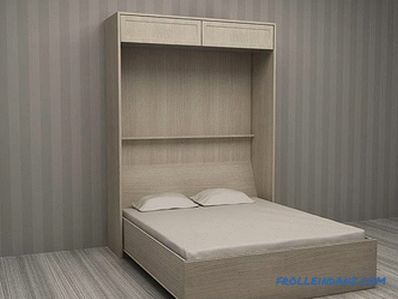 If you place the headboard bed to the doorway, you will not be able to see who enters the bedroom. It is better that there is no chandelier hanging over the bed. 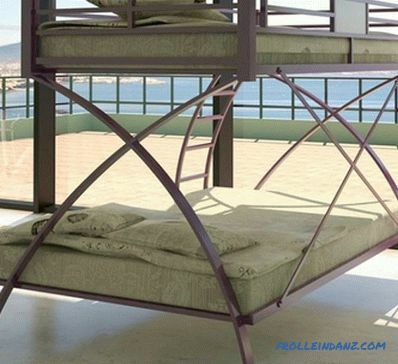 She may fall off and fall on a person lying in bed. 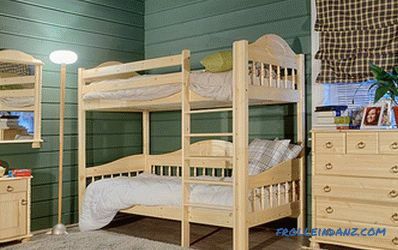 In non-insulated houses, the exterior walls are very cold, so it is better not to put the bed in such places. A shelf unreliably nailed to the wall above your head can also cause a lot of trouble. 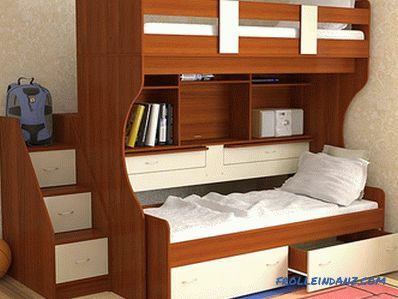 In a narrow bedroom, a bed located in the center of the room will not allow free movement. In addition, such an arrangement can cause discomfort. Many people leave space at the head of the laptop. Note that this "thief of time" in this case will deprive you of many hours of good rest. It may give the impression that there is no room left for the bed in the bedroom, but this is not so. We only gave recommendations, and you yourself decide how they are relevant in your case. Do not be fooled by the seeming simplicity of design. 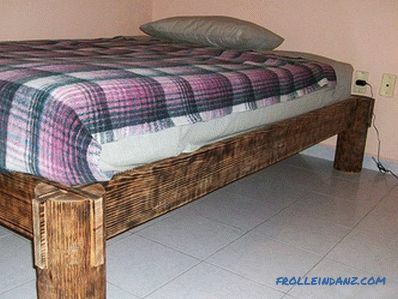 You need to tune in to the fact that you have to work a lot to make a bed out of solid wood. If you are determined, then there is every chance to do something original, while saving money. 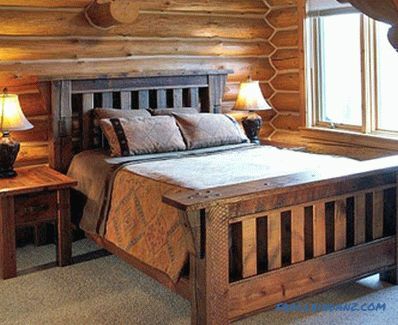 It is quite natural that at once it is not easy to determine the design of the bed, so first look at a few photos of wood products. When you choose a product you like, you can find a similar drawing on the Internet or draw it on your own about, considering the room size and personal preference. 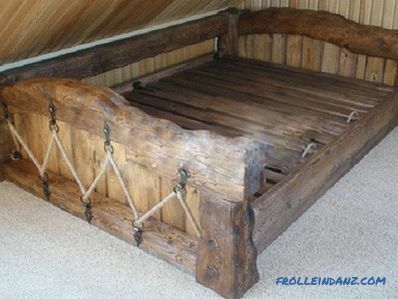 Often, homemade craftsmen take a drawing of the bed and rework it for themselves, removing or adding something. If you are not going to sleep on the boards, then when planning the size of the bed you need to take into account the dimensions of the mattress. If it has not yet been purchased, then this must be taken care of in advance or on standard sites you can find out the standard sizes and start from this data. If you plan to make a bed of non-standard sizes, it is important to know what the mattress will have to do on an individual order. 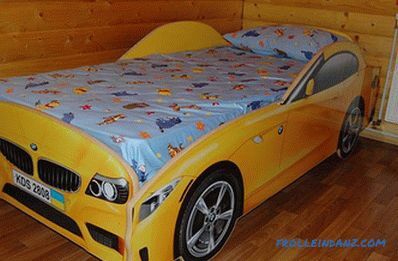 A custom-made mattress is a bit more expensive. 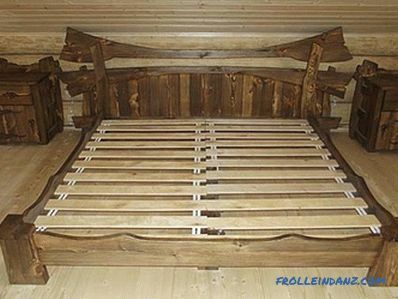 It is clear that in a relatively small article it will not be possible to describe the manufacture of several wooden beds, and we do not even strive for this. Based on the above example, it will be possible to understand how to build a bed from an array. 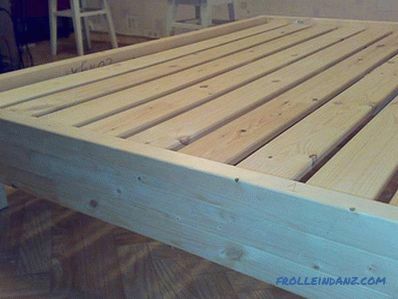 Let's consider an example of making a wooden bed under a mattress 200 * 160 cm, if there is a minimum of tools - only the most necessary ones. 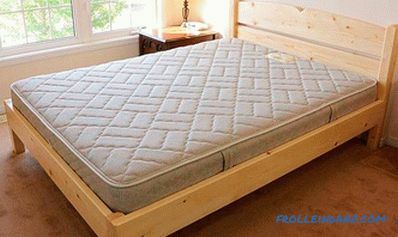 The actual size of the mattress is often different from that stated by the manufacturer, and in a smaller direction. When purchasing a mattress, measure it, and then adjust the size of the bed to be made. 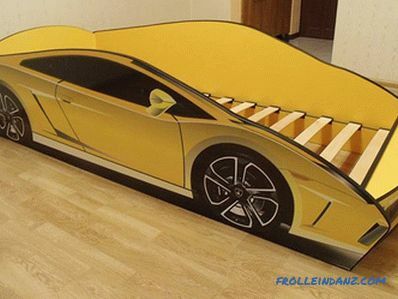 If there is no drawing with a bed that fits the size of the mattress, then you can use any one you like as a basis, remaking it to fit your size. If the design is very simple, then you can draw a sketch yourself. Bar 50 * 40 mm with length 209 cm - 19 pcs. 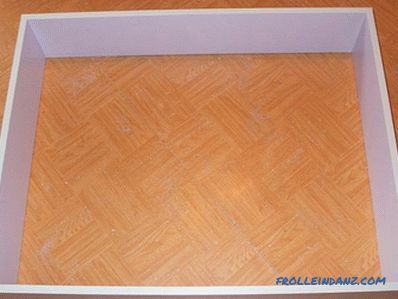 Planed board 22 * ​​100 mm, length 159.5 cm - 18 pcs. Self-tapping screws 41 and 65 mm. Having a clear idea of ​​the quantity and size of material required, you can go to the store for it. 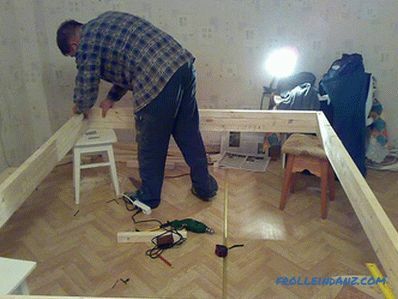 You can assemble the frame on the floor or on four stools. 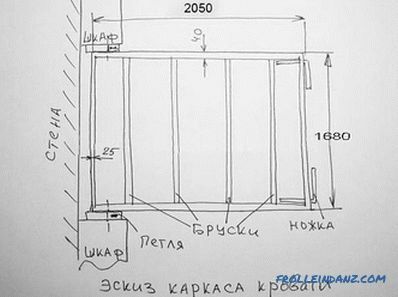 So, we need to make a rectangle with internal dimensions 200 * 160 cm that corresponds to the dimensions of the mattress + 1 cm tolerance. 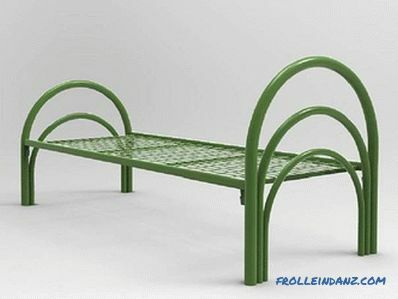 Each side of the frame will consist of three bars assembled into a single structure. Out of 19 pcs. 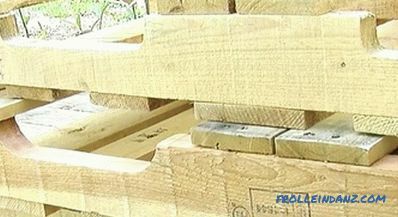 purchased timber 40 * 50 mm, you need to choose 4 pcs. the smoothest and with the minimum amount of knots. For further work, it is necessary to cut off the excess at a right angle. 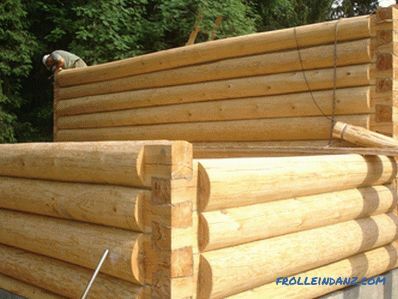 With sufficient skills, you can mark the timber, and then, using the construction corner, draw a cutting line. If a hacksaw along the line can not be cut off smoothly, then it is better to use it. 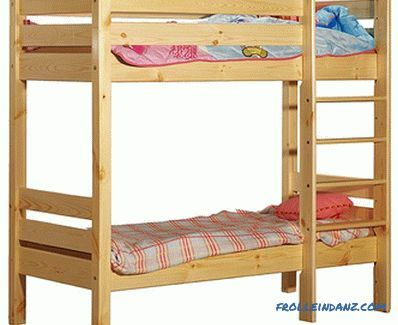 There should be 2 bars of 160 cm each and 2 bars of 208 cm each (internal size of the bed length is 200 cm + 2 bars of 4 cm each). 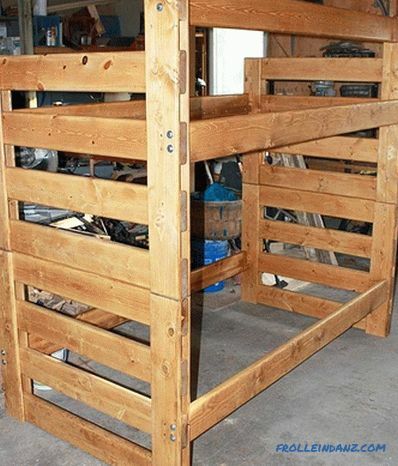 The cleanest side of the bars will be used as the front (top of the bed), so with this side we place the bars down. 4 more bars with the same dimensions will be required. You also need to cut off 2 bars of 200 cm each, and 2 bars of 168 cm each (inner size of the bed width is 160 cm + 2 bars of 4 cm each). In order for the frame to be strong, the corner joints must be made overlap, so for the second row we use bars of a different size, which we sawed last. 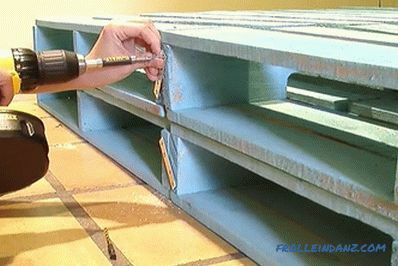 Glue is applied on the bars of the first layer, and then the bars of the second row are laid and attracted by screws. Excess glue must be removed immediately, otherwise it will interfere with the work of grinding the surface. Now the bars of the third row are fastened in the same way. 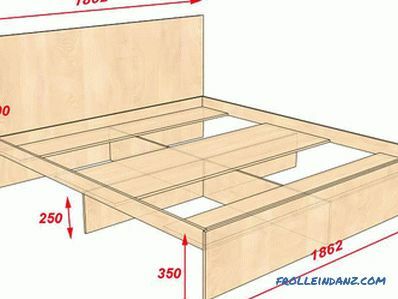 We need to check that the corners of the bed are collected at an angle of 90˚. To do this, measure the dimensions of the assembled frame diagonally - they must be the same. After the glue dries, you can continue working. Since our mattress is 159 cm wide, this size is quite large - the boards we use can sag. To eliminate this, in the center of the bed, from one back to the other, from the bottom, you need to make a stiffener. 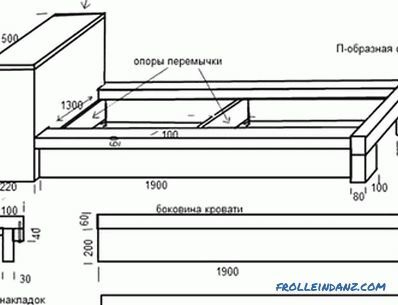 For its manufacture will require 2 bars with a length of 2 m each. 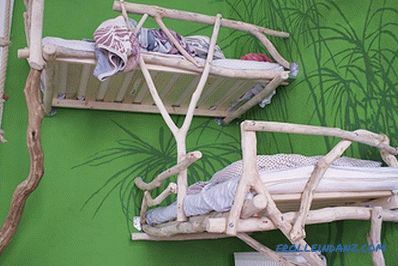 They are also fastened together and installed in the same plane with the bottom of the bed. This is clearly seen in the photo. At the manufactured bed there are 4 legs located at the corners , but for security, you can set the fifth point of support in the center - then the base will not bend for sure. The legs will be made of two bars 40 * 50 mm, fastened together. Their height is chosen according to the preferences of the owner in such a way that they will be attached to the lower two bars. Having stuck and fixed the legs with screws, we wait until the glue dries, and only after that we turn the bed over to the position in which it will now reside. 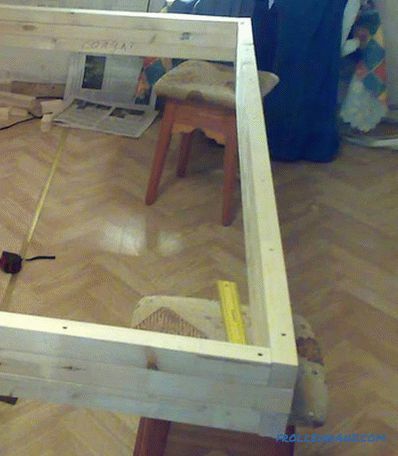 For making the base for the mattress along the sides bed frame need to fix the remaining timber 50 * 40 mm (or existing trim), since it will be attached to the board. A guideline will serve as the lower edge of the upper beam frame. The width of the inner part of our product is 160 cm, so in order to avoid the squeak of the board, you can make 5 millimeters shorter - 159.5 cm (or slightly less). 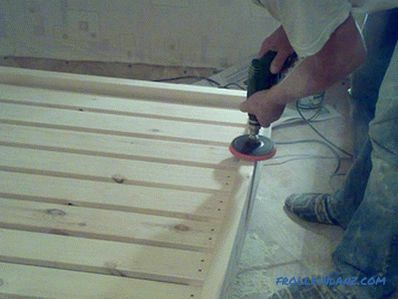 Sanding the boards, you need to lay them on the frame so that they do not touch the sides of the frame walls, and fasten. Since the screws will be screwed from the edge of the board, you will need to drill holes in each board using a thin drill. As for the distance between the boards, we find it by experience. 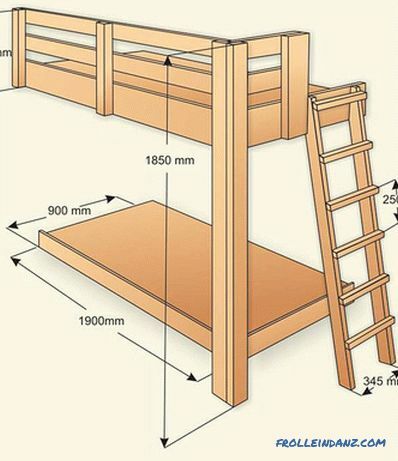 In our case, the length of the inner part of the bed is 200 cm. We deviate 5 mm from the edges. 199 cm left. Divide by 16 (number of boards). 199/16 = 12.44 cm. Let's round it up, and it turns out that you need to apply the markings on the support beam every 12.4 cm. Since the width of the board is 10 cm, the gap between them will be 2.4 cm, which suits us completely. If you need to get a greater distance between the boards, then you need to reduce their number and again perform the calculations according to the scheme given by us. 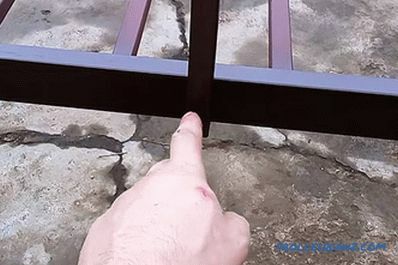 Now you need to sand the entire structure. 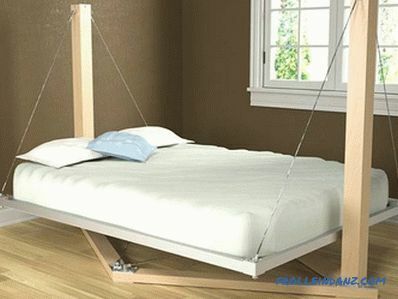 For this, it is better to take the bed out of the room, as there will be a lot of dust. It is convenient to use a grinder or a drill with a nozzle on which an emery cloth is attached. After mechanized processing, you need to complete the process manually using a fine-grained emery cloth. 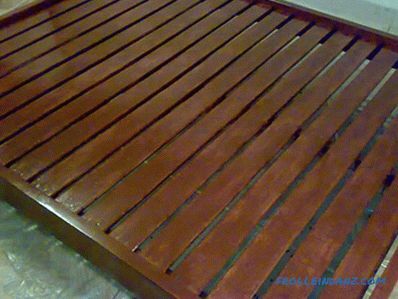 Bed should be primed and varnished in several steps Each layer is applied after drying the previous layer. Work is best done using the spray gun. In extreme cases, you can use a brush, but it is important to understand that the appearance of the applied coating will not be the same as when using a spray bottle. You probably noticed that we still had 3 boards left. From them we will make the back, as in the photo. 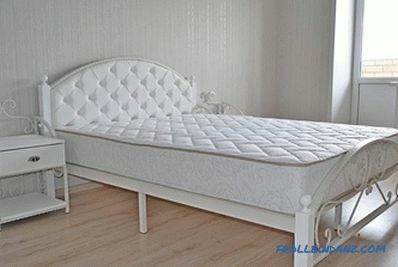 The height of the backrest is 45 cm, and the width is 170 cm, but this is not important, since it will not be a single unit with the bed - we will fix it on the wall to the level of a mattress. Its production is not complicated at all. Three boards are sawn at 170 cm. Of the scraps we make 11 boards of 45 cm each. 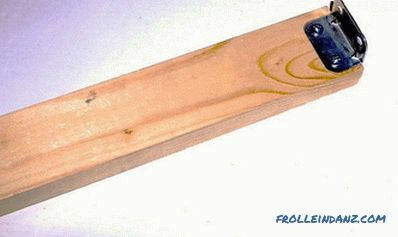 If there are not enough boards of 45 cm each, then one board can be screwed on 2 boards of 40‒42 cm. 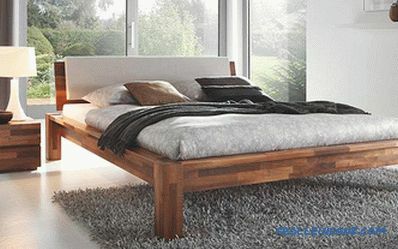 Just like beds, you need to give the backrest a presentable look. Varnishing it. The back can be hung with hooks, only in this case it will knock against the wall. More practical is to firmly fix the back on the wall. 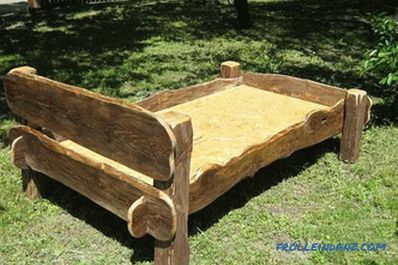 Now you can use a wooden bed. 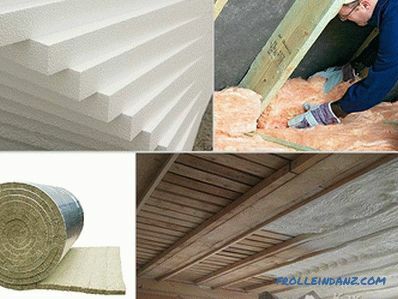 Making chipboard structures can seem very complicated, due to the nature of this material.If you cut, grind and glue the edge at home, then there are some difficulties, especially with cutting chipboard, as it is possible to damage the decorative layer. 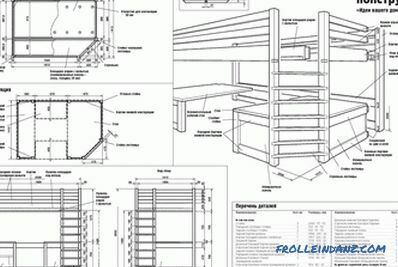 Many problems can be avoided if you make a drawing in advance and order the manufacture of parts in the furniture workshop. Houses will only build the structure. 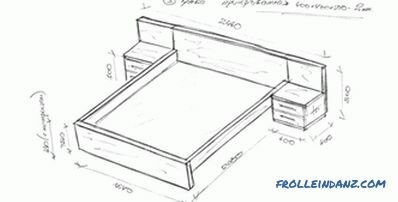 This time we will look at the process of making a small single bed with two drawers. 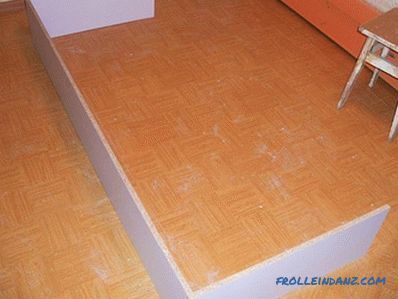 Here is an example of cutting a standard sheet of chipboard for one bed. You can make book shelves or something else from the rest of the plate necessary in the economy. So, we have a ready-made set of parts that need to be assembled to make a bed. Stickers or plugs for confirmats - 50 pcs. Self-tapping screws 3.8 * 45 mm - 15 pcs. Self-tapping screws 3,5 * 30 mm - 30 pieces. Self-tapping screws 3.5 * 16 mm - 40 pcs. 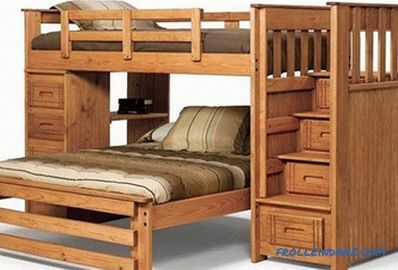 Furniture corner - 12 pcs. Linear roller - 8 pcs. 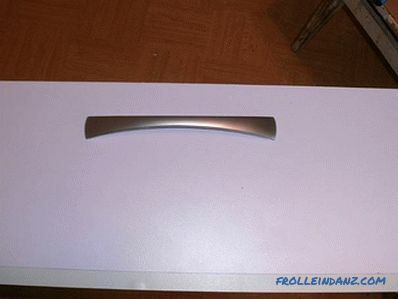 Wide furniture handles - 2 pcs. Plastic legs - 12 pcs. Bar 20 * 45 mm (3 m) - 3 pcs. Now we proceed to the assembly. 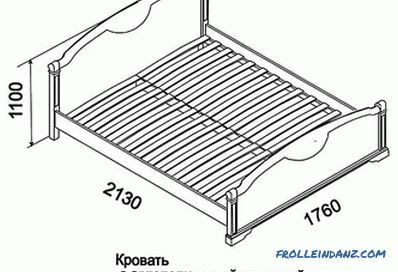 Since the mattress will be used 200 * 70 cm, we will adjust the available slats to the width of the mattress, making them 70 cm long. As a result, there will be 12 pieces. Ten corners must be attached to the corners on one side. is attached to the bar. 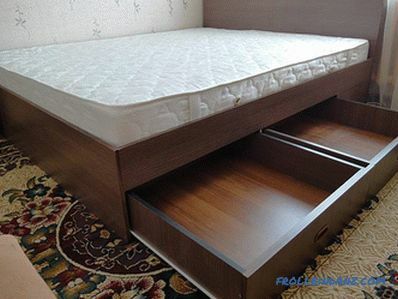 First we will manufacture the drawers that can be pushed under the bed. First of all we will collect a framework. To do this, we will decompose the blanks so that the part glued over with the edge is at the top. When assembling it is important not to confuse the parties. Well, if the edge is not glued from the end of the inner part, then you will not mix it up. If the edges of the parts are glued in a circle (which is wrong), then you need to try to fold the box without twisting it, and then attach the bottom. Making sure that everything matches, you can proceed to the assembly. Departing from the lower (or upper) edge of the order of 3 cm, you need to drill a hole with a confirmation drill. This should be done carefully, as one awkward movement - the detail will be spoiled. The thickness of the laminated chipboard is 16 mm, so we deviate 8 mm from the edge of the workpiece, drill a hole slightly with core, and without the slightest deviation. If you have never collected furniture from chipboard, first practice on unused sheet residues. Combining the parts, we get such a box. In order to fasten the bottom, eight confirmets will suffice - 2 on each side . These boxes are not designed to store very heavy things in them, because plastic rollers are not designed for this. 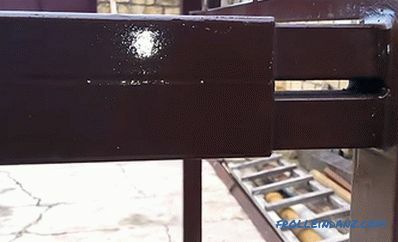 It remains to attach the handle and install the rollers. One box is ready, now the second is being assembled in the same sequence. Using a wide handle is more convenient. Putting the finished boxes to the side, we will begin to assemble the bed. 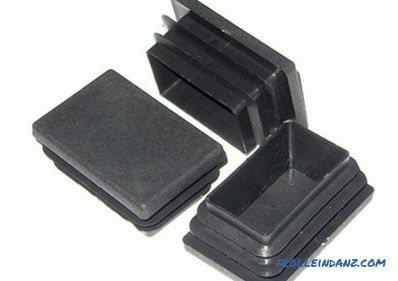 Since boxes will be installed on one side, 3 parts need to be assembled together, using 3 confirmats on each side. As a result, we will have such a "bench". 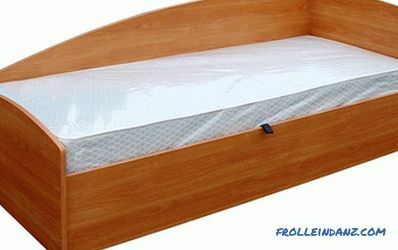 Now we will assemble a decorative box, thanks to which the mattress will be fixed. This part is not as high as the bed base, so 2 confermats will be used for each side. 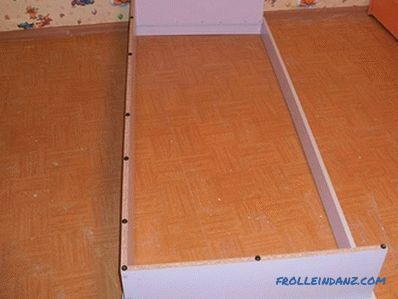 We put the resulting frame on the bed frame so that it does not interfere with opening the drawers, and join them together from inside with 3.5 * 30 mm self-tapping screws. It is necessary to nail plastic legs. Let’s proceed with the manufacture of fins. 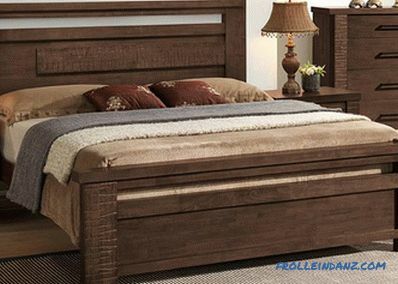 At the front of the frame it is necessary to draw a line from one edge to the other along the height of the bed frame. Now we will fix the bars with the corners fastened to them every 13 cm, so that their lower part is exposed along the line. 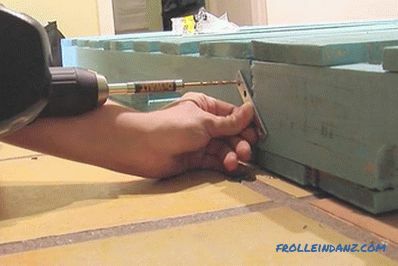 Instead of fins from boards, you can use a chipboard cut to size. After this, 30 mm screws will remain screw the bars to the opposite sidewall. 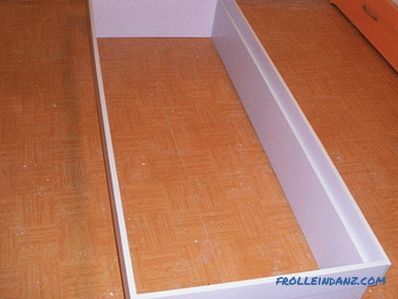 You can start using the bed by folding the boxes . 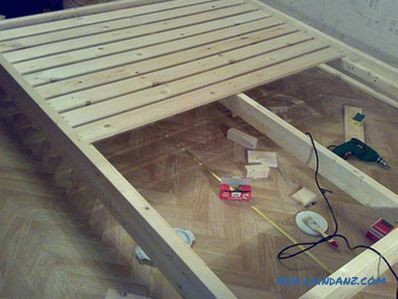 As you can see, with the right approach, it will not be difficult to assemble a bed from chipboard home conditions. The design can be of any size, as in the following video. 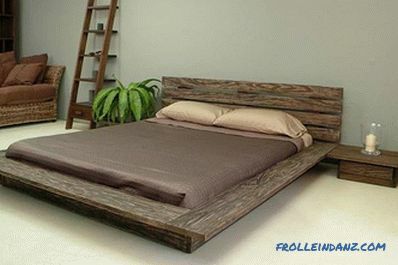 Beds made of pallets are now in fashion. 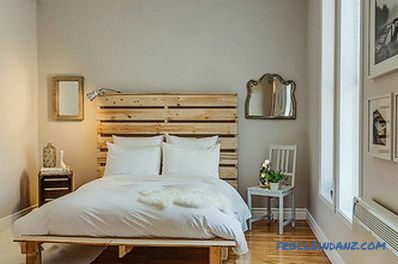 At first glance it may seem that this kind of construction would be appropriate only at some provincial cottage, but this is not so, because the beds from the pallets can be found in houses with a rather rich furnishings. From words to the case. 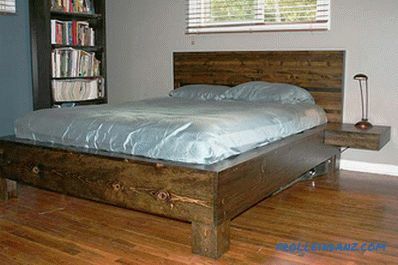 Consider one of the options for assembling beds from pallets. How many will they need? It all depends on the size and design of the manufactured product. 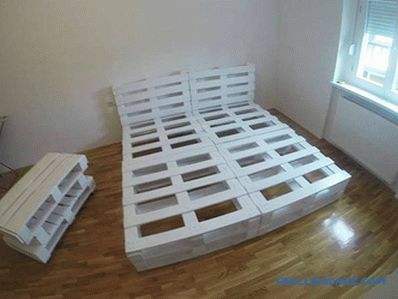 So, a single bed with legs can be made from 2 pallets, and without legs - from 4 pallets. 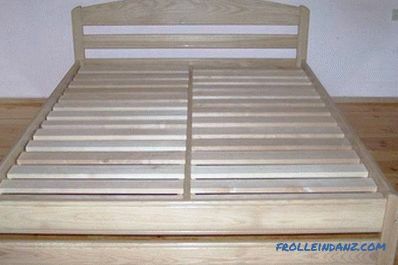 For the manufacture of our double bed, we used 8 pallets. If there is such an opportunity, then you need to select the most complete pallets. They need to oshkurit. 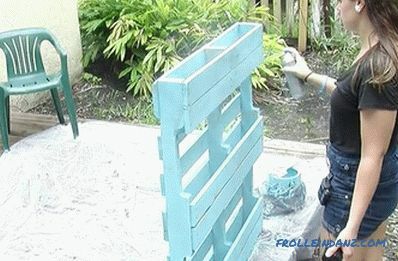 All pallets should be painted using non-toxic paint on wood. 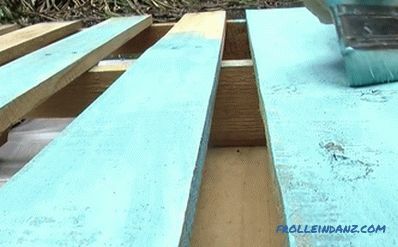 Since the wood is very hygroscopic, it is most likely that pallets will need to be opened with paint 2–3 times. If there is such a desire, you can open the blanks with varnish. 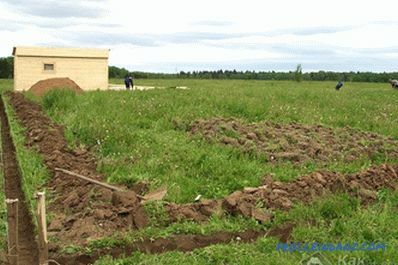 Having laid the first row of pallets, you must fasten them. 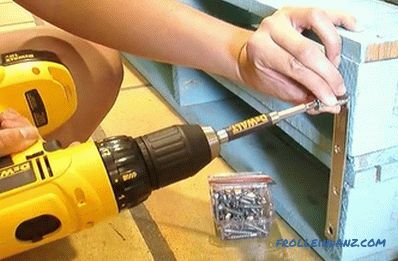 If the wood is very strong, then holes are drilled under the screws. Then the second row fits. All pallets are stapled together using metal plates, fixed with screws on the tree. 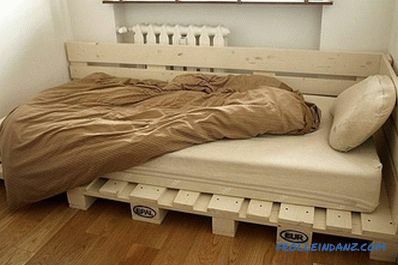 Thanks to this simple technology, you can make quite a decent bed out of pallets. 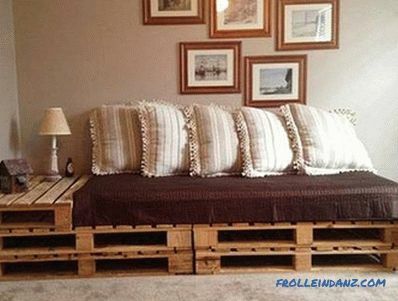 You can also make back pallets. 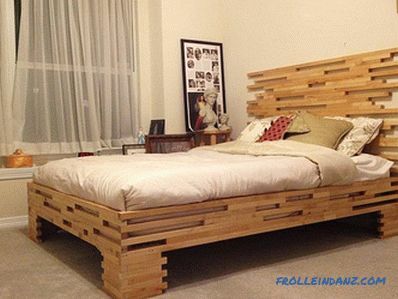 You can assemble some furniture from the remnants of pallets and install it near the beds. In general - who likes what. 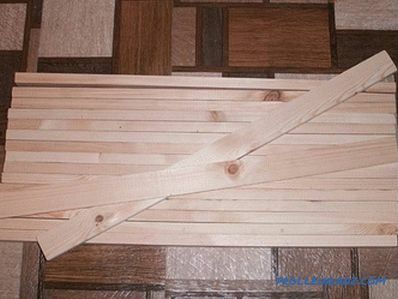 You won't surprise anyone with plywood products, but you can make furniture out of it at home. 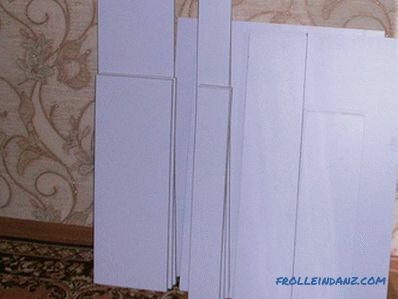 We will use sheets of the FSF brand, as not every plywood is suitable for making a bed. 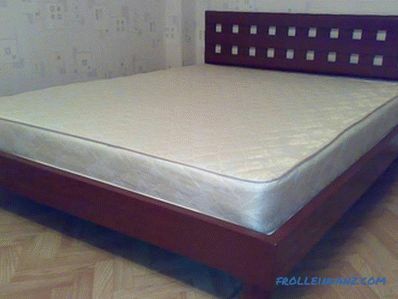 Consider an example of making a bed for a spring mattress 1900 * 900 * 200 mm . The thickness of the plywood used can be 12, 15 or 18 mm. 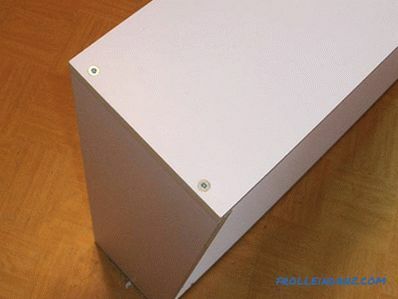 Thin sheets can be used when fixing plywood with screws. 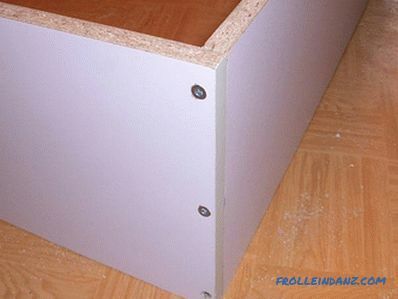 From 18 millimeter plywood the bed will be stronger, but very heavy, therefore it is preferable to use sheets with a thickness of 15 mm - they are much stronger than standard laminated chipboard. Plywood 2.44 * 1.22 m - 1 sheet. Bar 30 * 40 mm - 2 pcs. 1.9 m each. Bar 30 * 40 mm - 7 pcs. 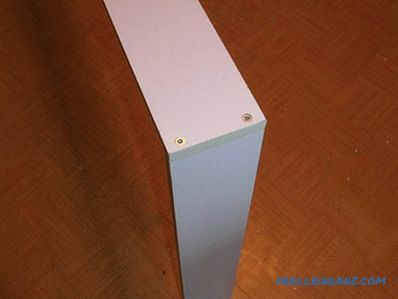 0.9 m.
If the edges of the parts need to be pasted, then purchase additional PVC edge. Its consumption will be no more than 8 p / m.
Glue "Moment" - 1 tube. Screws 5 * 40 mm - 26 pcs. Screws 5 * 60 mm - 12 pcs. Screws 3 * 9 mm - 8 pcs. Thrust bearings - 4 pcs. As for the tools, they are the same as for working with chipboard. Instead of screws, you can use screws on the tree. The side wall of the back side of the bed is large in height. 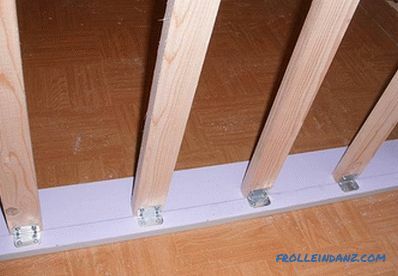 This is done so that the drawers under the bed do not rest against the walls. If there are no boxes, then the side walls can be made the same. From the existing sheet of plywood you need to cut out the parts corresponding to the drawing. 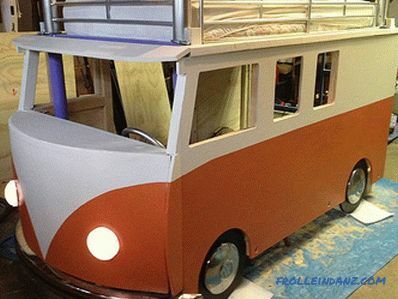 If you prefer, you can use laminated plywood. 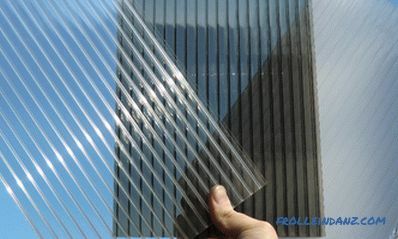 In this case, it is important to consider that it is not easy to cut such a sheet at home without damaging the laminated coating. In addition, then the edges without fail will have to paste over the furniture edge. The back of the front is 932 * 650 mm. The back back - 932 * 500 mm. 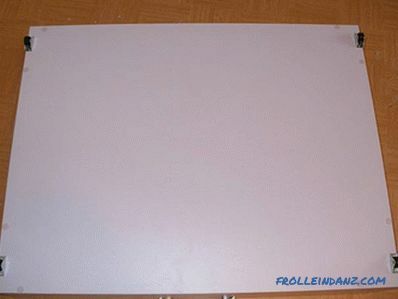 The front side panel is 1900 * 200 mm. 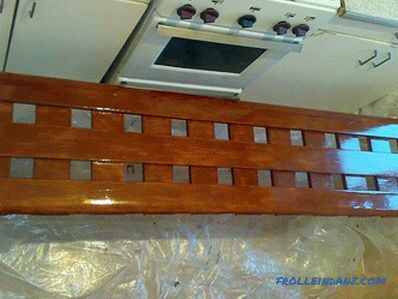 The back side panel is 1900 * 350 mm (if without cabinets, then we also do 1900 * 200 mm). The ends of all the parts must be sanded. To do this, you can use a small wooden bar wrapped in an emery sandpaper of medium grain. After this, we assemble the bed frame. Backs are attached to the side slats with 5 * 40 mm screws (2 for each front side, and 3 for the rear). Then we fasten the timber to the side rails of the bed with screws of 5 * 40 mm (7 pieces per side). 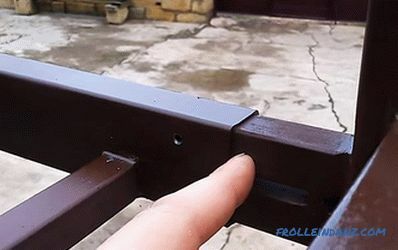 The cap of the screws should be slightly recessed into the bar. If you drive it deeper, the screw will go through the plywood. We fix the cross-beams from the bar on the horizontal bars with 5 * 60 mm self-tapping screws (1 for each point). Fasten 5 * 40 mm screws from inside the bars to the backs (3 screws each). At the last stage, lower the backrests, fasten the thrust bearings to the backs - 2 screws 3 * 9 mm each. We set up the bed, we put the mattress and use our product. 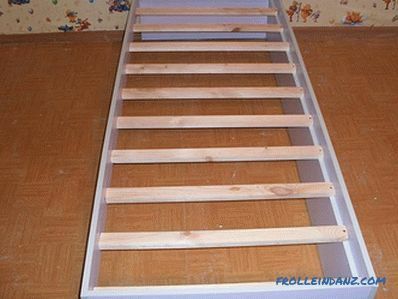 If instead of a spring mattress on the frame to use soft, then from plywood you need to cut the bottom and fasten it to the bars from above. 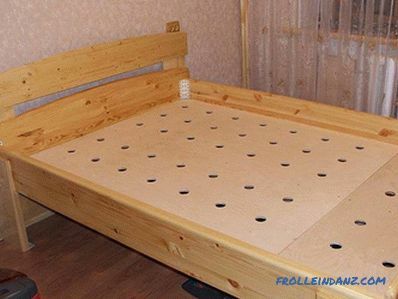 As you can see, there is nothing difficult in making a bed of plywood. 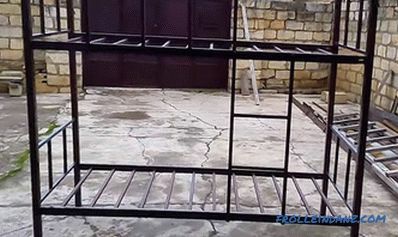 If you have some skills as a welder, you can make a metal bed. We will not even consider the bolted connection option, since such a product is very quickly loosened. 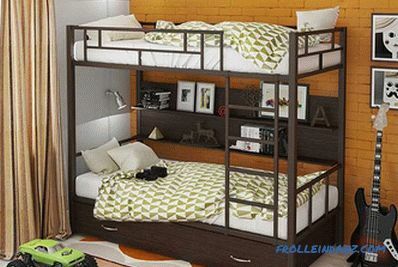 Look at the photo of a folding metal bunk bed. Agree that it looks very presentable. Profile pipe 50 * 25 mm - 8 m.
Profile pipe 40 * 40 mm - 8 m.
Profile pipe 20 * 20 mm (or 15 * 15) - 40 m.
In addition to pipes, a primer for metal and hammer paint was purchased. 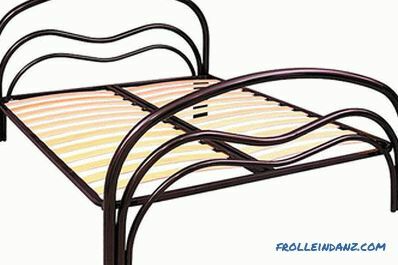 One of the advantages of such a bed is the absence of bent parts, so a pipe bending machine is not needed to make it. If you buy pipes, and not use those that have lain for several years in the garage, then do not stop your choice on rusty ones, since then they will need to be cleaned for a long time. 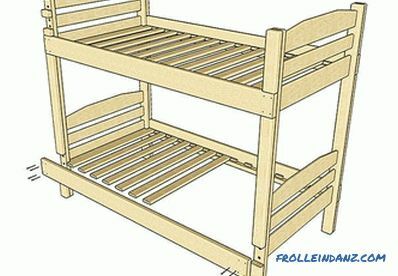 Since the bed is collapsible, it is possible to make its parts in parts. Let's start with the backs. The base will be 40 * 40 mm pipes. They are cut into equal parts of 2 m. If the ceilings are low, then we can reduce to 185 cm. The width of our backs will be 90 cm, so we will cut 8 equal segments of 82 cm from the 20 * 20 mm pipe (90 (4 + 4) = 82), and 8 pipes of 30 cm. For now, we will use only half of the harvested material. On a flat plane parallel to each other you need to lay the pipe-rack. Having retreated from the bottom of 40 cm and from the edge of 1 cm, a pipe 82 cm long is hooked. 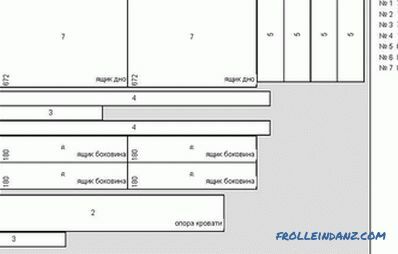 It is necessary to check the correctness of the angles set by the building corner. A second pipe is seized after 95 cm. We return to the first one, and on the tacks we collect the grid - 2 pipes of 30 cm each and a crossbar of 82 cm. We do the same with the second grid. After checking the angles and alignment of the stuck parts, they can be welded thoroughly. A second back is made in the same way. Now we proceed to the manufacture of shelves. 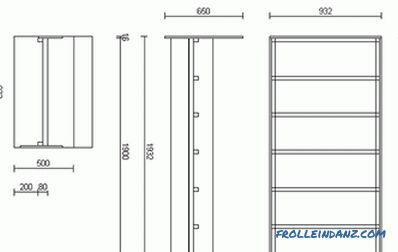 The profile pipe 50 * 25 mm will also be cut into 4 equal parts of 2 m.
The width of the shelves will be 88 cm, so we will need 26 pipe segments 20 * 20 mm by 83 cm (88- (2.5 + 2.5) = 83). 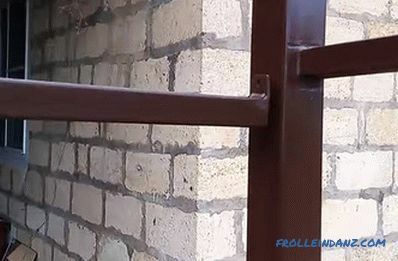 2 pipes are laid on an edge parallel to each other. From the edges, mark 13 cm each and grab one jumper by putting them along the bottom edge. Fold out the remaining 11 jumpers every 14 cm and grab them. After checking, the regiment is scalded, and the second is assembled in the same way. 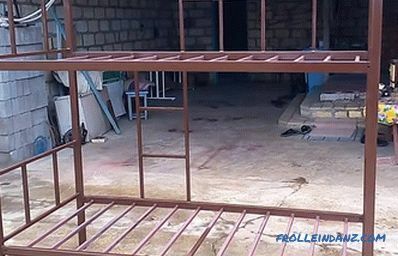 To the shelf that will be installed at the top, it is necessary to weld a fence of the same height as the height of the grid on the backrest. The pipe used for the fence, you need to bend, and not to weld at an angle. If there is no pipe-bending machine, then you can fill it with sand and bend it in a vice or between two supports. 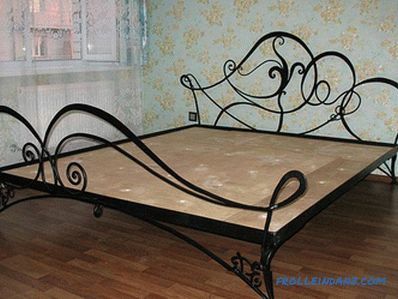 This pipe must be welded in the middle of the bed, as in the photo. 3 more vertical posts are welded in the same way , but it will not be welded to the back, so you need to weld a small bar from the end. The turn has come to put the construction together, for this we will use a little more welding. 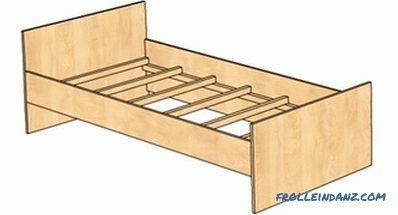 Since our bed is collapsible, we will make universal fasteners for it. From a 20 * 20 mm pipe, 16 pieces of 10 cm should be cut off and welded to the backs at the joining point. At each attachment point, 2 tubes are used. They are inserted into the grate tube and cling to the back. 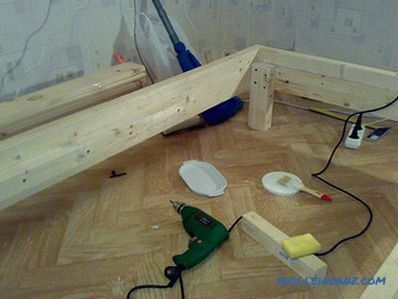 If this is not done, then it will not be possible to assemble the bed, since the attachment points will not coincide. Having checked the correctness of the location of the part, we thoroughly weld the tubes to the back. With the help of the grinder, weld seams should be machined. 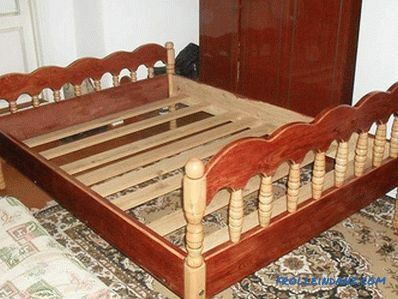 Now we will assemble the bed. In order for collapsible parts to stick together securely, they will need to be secured with self-tapping screws (after final assembly). will be screwed in here. 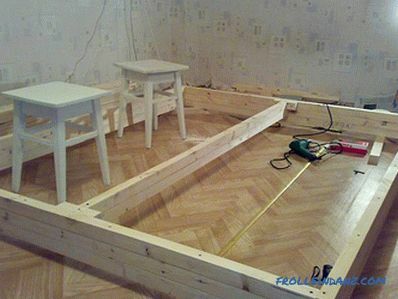 You also need to make a small ladder, the dimensions of which can be arbitrary. We will attach it to the shelves with bolts and nuts. At the final stage of the work, the entire structure is disassembled , degreased, primed and painted. 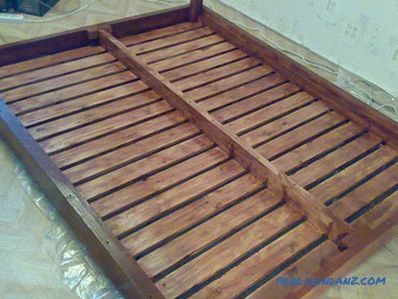 After the paint has dried, the bed can be brought into the house and assembled. To close the ends of the pipes, specially designed plastic plugs are purchased specifically for this. 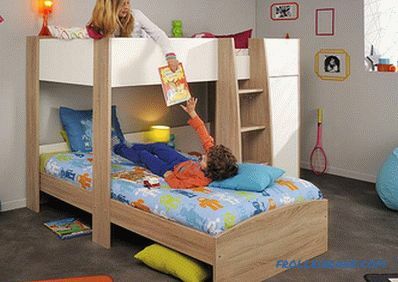 If the bed is made for children, its length can be significantly reduced. 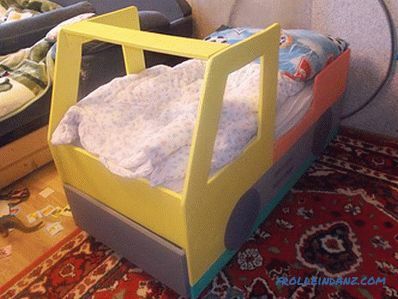 As you can see, at home you can make a beautiful and durable metal bed. 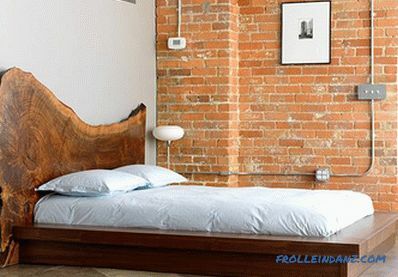 If you want to do something original, you can use forging elements instead of standard shaped pipes when making a bed. Such parts are sold in specialized stores or made to order. Good results can be achieved using bent parts, and you can bend them yourself. 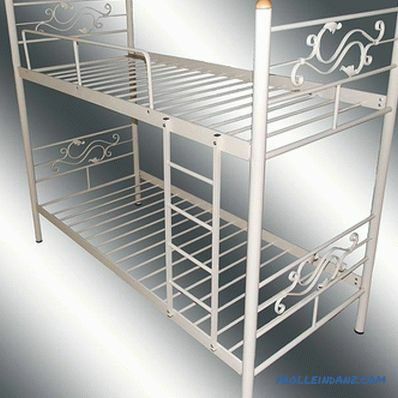 A person may have a wrong opinion that the legs of a metal bed will look rough. If you set a goal, then this element can also be made very attractive. 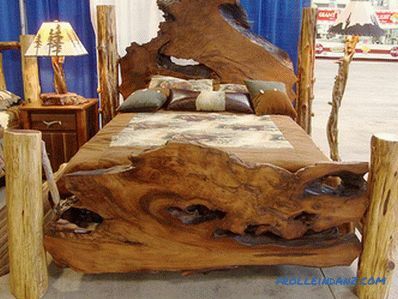 It is best if the bed is made from natural materials. 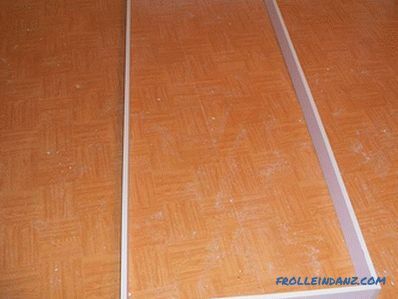 When using laminated chipboard, plywood, laminate and other materials with synthetic additives (glue, etc. 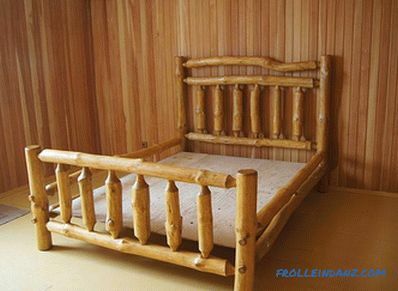 ), products must be certified for furniture production. The size of the bed is important. Single can be 100, 90 or 80 cm wide, and double - 200, 180 and 160 cm. If there are no restrictions on the size of the room, then you need to act on the principle - the more, the better. 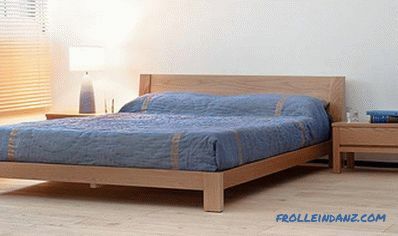 The length of the bed should be 20 cm longer than the person’s height (minimum 10 cm). Constructions made of chipboard (and chipboard) are the most unreliable and brittle. 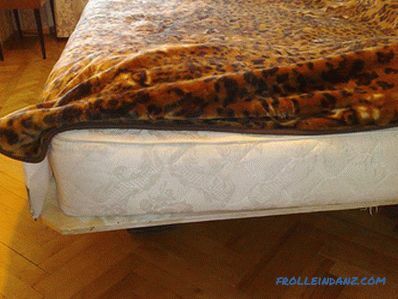 The continuous bottom of the bed does not allow the mattress to be ventilated, but too rare finning can cause the mattress to deform. Since we are talking about a mattress, there are some nuances of choice here. The mattress should not be hard. It should be soft enough, but not be too deformed by the weight of the person lying on it, so it must be selected individually. For a double bed you can pick up 2 different elastic mattresses. To make sure that the mattress suits you, you need to lie on it for 15-20 minutes before buying. 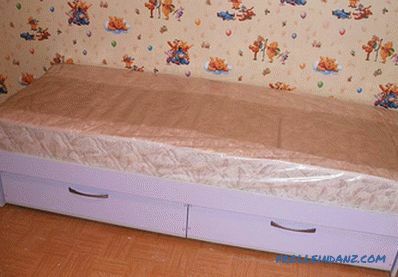 If you purchased a hard mattress, then you can put a thick mattress cover on it, for the manufacture of which latex or memoriform is used (from 3 to 10 cm thick). If you have not decided on the choice, then it is better to buy a mattress with two-sided rigidity. 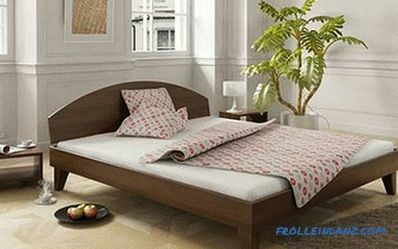 As for the design features of the bed, it is a matter of personal preference and convenience. 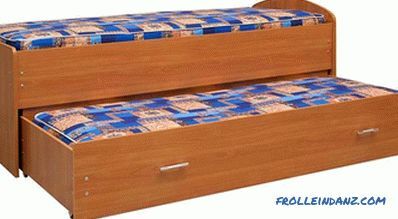 In a small room you can place a bed under which there will be drawers, foldable or pull out from the podium. In the large room you can give free rein to the fantasy by making a wide bed. 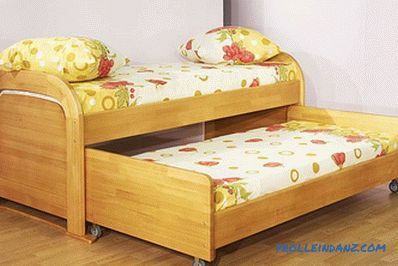 A single bed is installed when it is planned that only one person will sleep on it , whether child or adult.Also in the same room there can be 2 or more beds, for example for two children. Anyway, you first need to decide what design is suitable, and then take up the manufacture. 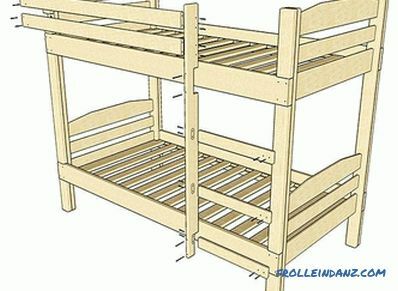 Help in this can make homemade single beds. 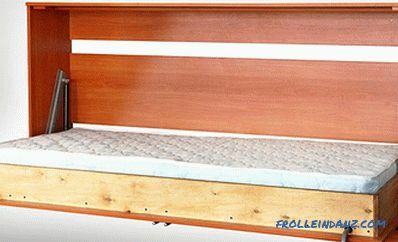 As a rule, married couples sleep together (at least for the first few years), and so that on this bed it was comfortable to sleep, you need to take care of its size and design. Look at the photo exhibition of double products. Usually a double bed is made for children. 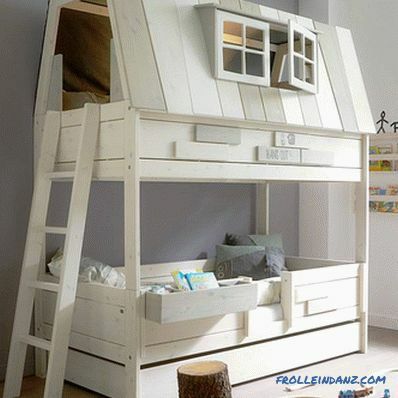 It can be either a simple bed or a fairytale castle in which the child will sleep with pleasure. 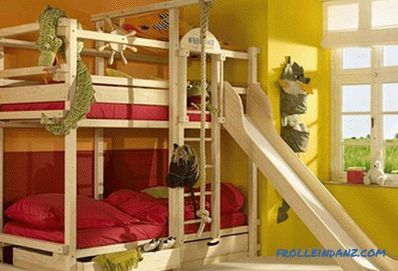 Choosing the design of this kind of children's bed, you need to think about the convenience and design.